Halo 4's multiplayer is getting updated. 343 Industries is trying make sense of the past Spartan slaughter-fests. Players will now compete in War Games, a simulated multiplayer experience. So, it at least makes sense why Spartans can gun down their brothers-in-arms, it's just a training simulation. In addition to the competitive multiplayer is a new cooperative mode called Spartan Ops: Briefing Room. These missions are based on a weekly spin-off series that takes place on-board the UNSC Infinity. Every week a new episode will be released comprising of five cooperative missions. This will expand on the Halo story after players have absorbed every bit of the campaign. Much like Reach, players will be awarded credits for everything they do in Halo 4. These credits will act as a currency to purchase new armor pieces and weapons. As players acquire more credits, they will also improve their rank which opens up new pieces of armor and weapons for purchase. Players will also have custom loadouts for the first time in the Halo series. 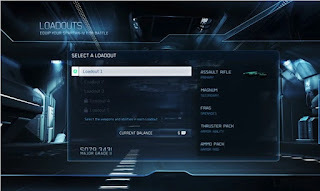 Much like Call of Duty, players can select a primary weapon, secondary weapon, grenade type, armor ability, and armor mod. Finally players won't have to be proficient with every weapon or memorize where their weapons spawns in order to do better. This is the system that I thought was going to be implemented in Reach, but I don't mind waiting for Halo 4's release in November.